“Set Fire to the Stars” takes its title from a Dylan Thomas poem and its plot from “Dylan Thomas in America,” the 1956 memoir by poetry scholar John Malcolm Brinnin. In 1950, Brinnin brought Thomas to New York to kick off a multi-city tour of general audience poetry readings and meet-and-greets with the heads of Ivy League universities. Thomas’ reputation as a Welshman who liked his liquor preceded him, and it was up to Brinnin to keep it from succeeding him while on this tour. 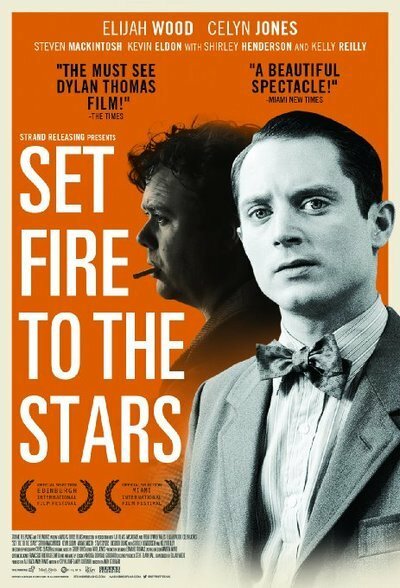 “Set Fire To The Stars” hinges on whether Brinnin (Elijah Wood) can keep Thomas (Celyn Jones) sober long enough for him to perform a big show before a group of Ivy League bigshots at Yale. If this sounds familiar, you’ve probably seen “My Favorite Year,” the 1982 comedy where Mark-Linn Baker was tasked with babysitting chronic drinker Peter O’Toole before O’Toole’s big comeback on live television. “Set Fire to the Stars” also evokes memories of “My Week With Marilyn,” the dismal Michelle Williams biopic where the boring story of a nobody overshadowed its more famous subject. Instead of a fleshed out, complex portrait of the artist as a tortured soul, we get to meditate on Brinnin and his clichéd quest for success. Brinnin even gets a nemesis named Jack (Steven Mackintosh), whose sole purpose is to sneer with pleasure whenever Brinnin screws up. With the focus on Brinnin, Thomas never feels like a real person, which is odd given that the actor who plays him also co-wrote the screenplay. There’s reverence in Jones’ portrayal, to be sure, but the movie keeps reducing Thomas to a series of actions on somebody’s checklist: He gets drunk, dispenses advice, gets drunker, looks for fights, sexually harasses women, vomits often, recites dirty (and very effective) limericks in polite company and repeatedly agonizes over a letter sent to America by his wife, Caitlin. Thomas is either too mortified or too apathetic to read it, depending on what the scene requires. The letter itself is a huge MacGuffin; Brinnin brings it up whenever Thomas irritates or embarrasses him, but this film could have easily existed without any epistolary subplots. When the letter’s contents finally manifest themselves in a visual interpretation by Kelly Reilly (“Heaven Is For Real”) , it serves no purpose besides being an arty device. The scene attempts to convey how strong Caitlin’s hold is on Thomas, but it plays out as a bad director’s choice. However, Reilly deserves credit for fully committing to her one scene: She crawls all over Thomas like a cat who's discovered a human-shaped bag of catnip. At one point, Brinnin tells Thomas “you’re scared of your talent.” The movie is equally afraid, because every time Thomas starts reciting that which made him famous, he is drowned out by loud, tinkly piano music on the soundtrack. Sometimes the tinkly piano is accompanied by a shot of Elijah Wood staring at us in rapture. We only hear one poem in its entirety, spoken by the entire cast in montage. Other than that instance, you’ll bring more knowledge of Thomas’ poetry and prose to the theater than you’ll get from this movie. His work hasn’t been this trivially used since Disney replaced rap music with “Do not go gentle into that good night” in “Dangerous Minds” 20 years ago. Hell, Rodney Dangerfield’s “Back to School” has more Dylan Thomas verse than this film. What “Set Fire to the Stars” does have is great turns by supporting players, especially Shirley Henderson and Kevin Eldon. As Stanley and his wife Shirley, the duo steal the film during a drunken dinner party that turns into a campfire-style swapping of ghost stories. Henderson’s tale is a great moment for the actress, and she gets to utter the Preston Sturges-worthy line “a man needs a hobby like a cat needs a bicycle.” Whether playfully boxing with Thomas in the background while her husband and Brinnin ramble on, or silently registering regret with her entire body in her final scene, Henderson grabs our attention by slyly shifting between overplaying and underplaying. Her choices are impeccable; I’d rather have seen a week with her and Thomas instead of Brinnin. Shirley’s spooky tale is aces, but when it’s Thomas’ turn to spin a yarn, the movie wrenches the spotlight from him, pointing it instead at Brinnin while he tells an interminable true childhood tale about injecting a mouse with a syringe full of Dran-O. It stops the film cold and plays as if the star demanded to have a big, useless monologue stitched into the movie the second it was being wrested from him by character actors. As tedious as “Set Fire to the Stars” gets, it remains watchable courtesy of the stunning black and white cinematography by Chris Seager. It has a meditative quality that had me scanning the frame for hidden treasures. I kept getting lost in the gorgeous wisps of smoke rising from the cigarettes of Thomas and a diner patron as they recited Shakespeare and flirted with a waitress named Rosie (Maimie McCoy, who’s a hoot as she slings both hash and torrents of diner lingo). The film’s early scenes of winter in New York beautifully capture snow falling past the characters’ faces. With this, “Gueros” and last year’s Oscar winner, “Ida”, I hold out hope for the re-emergence of the art of black and white cinematography. It can save almost anything, or at the very least, it can valiantly try. Of the controversy “Dylan Thomas In America” generated, Brinnin said “I think I am as well-known as I deserve to be.” “Set Fire to the Stars” overplays just how much celebrity Brinnin deserved.